We had a lot of radishes in our kitchen garden, ready to be harvested. Eating a simple green salad with radishes, cucumber and basic vinaigrette is great. But after a few days we wanted something different with the rest of the radishes. They’re still going into our salad, but it’s definitely something new for us to pickle them. We also have dill in our kitchen garden, but you can use all kinds of herbs. First you’ll need a clean preserving jar, therefore you can best cook the jar in boiling water. 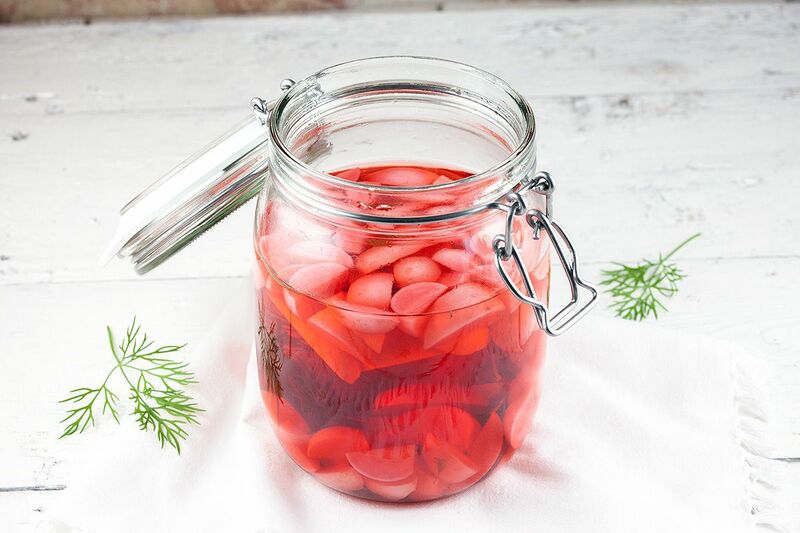 That way you are sure there are no bacteria in the jar that will destroy your radishes. 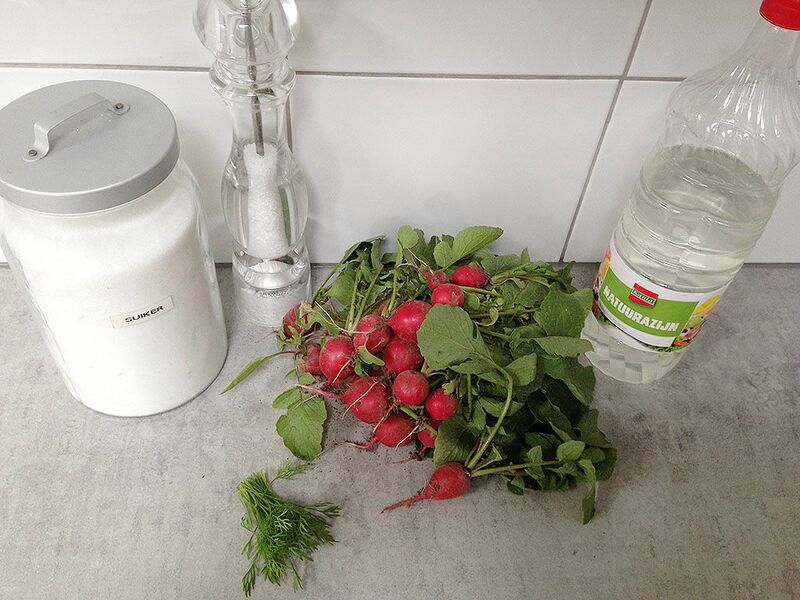 RINSE all of the radishes and get rid of its greens. COMBINE vinegar, water and sugar in the small saucepan and bring to a boil. When the sugar has dissolved completely, turn off the heat. 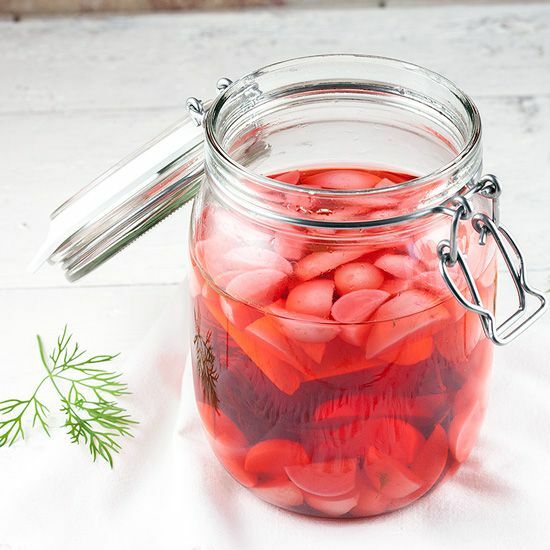 Meanwhile slice the rinsed radishes into quarters and ADD them to the clean preserving jar along with a few sprigs of fresh dill or any other herb. POUR over the vinegar mixture and place the lid on the jar. The longer you’ll wait before using them, the colour will change to very pretty pink. But don’t wait too long. If you opened them, you have to use them within 5 days. 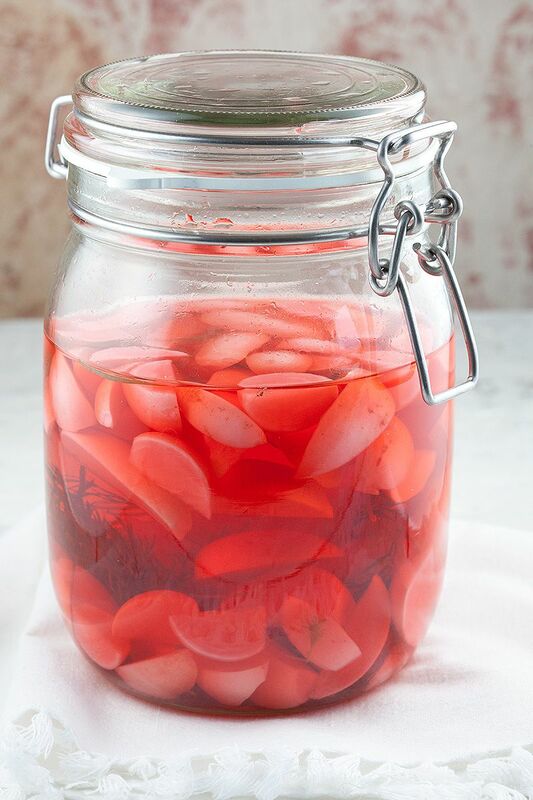 We find that these pickled radishes taste a bit like sauerkraut. Enjoy!